“We have already declared the LTTE should be accepted as sole and authentic rep of Tamil people we have got an overwhelming mandate from our people. 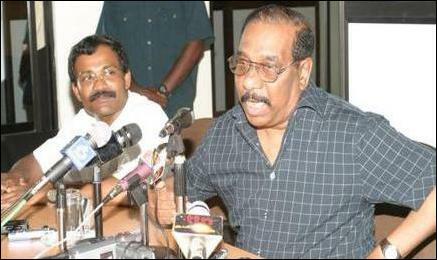 Talks should be on an equal basis - that the LTTE should be treated as equal partners in the peace process. And thirdly the LTTE has insisted that the Interim Self Governing Authority, the set of proposals we submitted last time, should be basis of negotiations. The talks should be held outside Sri Lanka. We discussed these matters today”. “(President) Kumaratunga has agreed that she is prepared to accept the LTTE as the sole representatives of the Tamils and the talks can be held on the basis of equal partnership; and the ISGA proposals could be the basis of negotiations. But she has said that apart from discussing the ISGA parallel discussions should be resumed (held) for a permanent settlement of the ethnic conflict”. We have said that it requires serious fundamental and changes in the constitution. But we want first of all to have this interim administrative structure established and the serious socio economic problems- resettlement, rehabilitation, reconstruction and resettlement must be addressed though this interim structure. It is only thereafter negotiations for the permanent settlement can be resumed. We argued that Kumaratunga’s government is a minority government with a hung Parliament. She doesn’t have the required two-thirds majority to effect radical and fundamental changes in the constitution to bring about a solution to the ethnic conflict. So it is rather fruitless. It will be extremely difficult for her to address the national question at this juncture. So we have suggested let us discuss the ISGA proposals immediately. And if she agrees, we will immediately resume negotiations. This message is conveyed to the President through the Norwegian Foreign Minister”.